Every child and teacher in the school brought a handful of clay from home to the school. In each classroom this clay was poured into a bowl. Then on the day of the ritual these bowls of clay were brought by the children in procession to a central space where the clay was poured into a larger urn (or churn), thereby mixing all the clay received into one. In this way Common Ground was created in which all have participated. This now holds our identities and all our trust; it represents us and our work together. This mixed clay will then be brought to a plot on the school grounds where it will be poured as bedding in which a holly tree will be planted. The clay and the growing tree hold concepts of respect, of sharing, of diversity, of inclusion, of poetry and learning. Many thanks to all the parents and everyone who supported the shoe box appeal. Huge congratulations to our girls U13 football team who defeated St. Ursula's to win the Roinn B Eastern final in Walsh Park on Wednesday October 24th. A very proud day for the school. 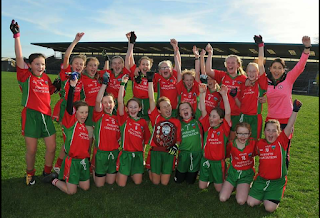 We would like to wish the girls the very best of luck in their upcoming county final (date and time to be confirmed). 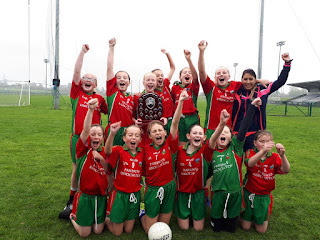 Congratulations to our girls football team who won the Mini 7's tournament in Carriganore on Tuesday October 16th. The girls battled hard in bad weather conditions to overcome Gaeilscoil Port Láirge and Holy Cross. 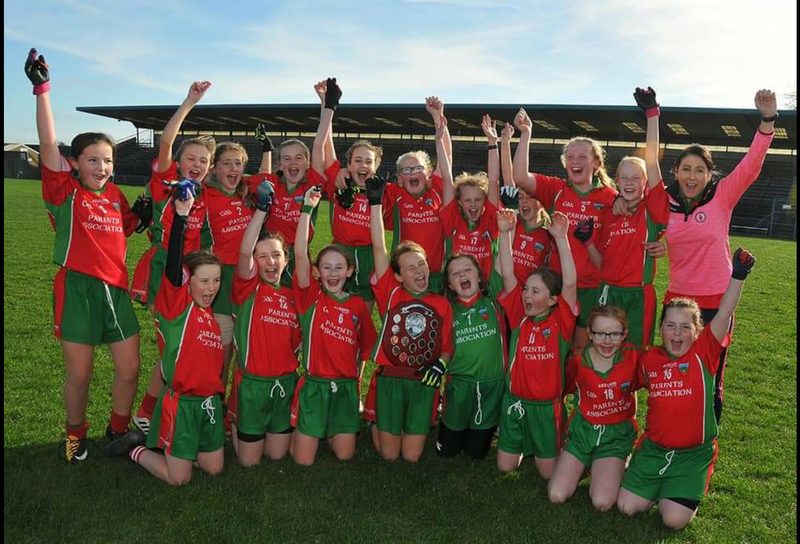 We are all very proud of the girls. 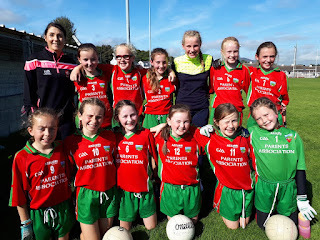 We would like to wish them the very best of luck in the U13 Eastern final on Wednesday October 24th at 12.40pm in Walsh Park. Congratulations to Clonea on winning the Intermediate Hurling Final in Dungarvan on Sunday and best wishes to the club playing at senior level. 6th Class picked, peeled and chopped apples from the school orchard which were then stewed and served with custard and ice cream to all pupils on Friday last. A donation was made to Richie Kennedy of Fitness Freak to sponsor 1 weeks fruit to St. Josephs Hospital, Clonmel. Richie Kennedy is always looking for sponsorship for this great initiative if anyone wishes to sponsor it. Congratulations and well done to Luke on winning an Author Achievement Award for his story of "Lackendarra Jim". Thank you to all who baked cakes and supported our bake sale, which raised 1100 euros. The children were challenged to equal the 3,563km cycled by Sam Bennett in the Gino D'Italia. They beat this by cycling a total of 4,794km during the week. Well done everyone.